historiccabarrus | Historic Cabarrus Association, Inc.
Christmas in Cabarrus takes us back in time with vintage toys from Blackwelder’s Toyland of Concord, historic images from classic Concord Christmas parades, Christmas decorations from around the county, and Christmas cards sent from Servicemen to the Concord Canteen during World War II. 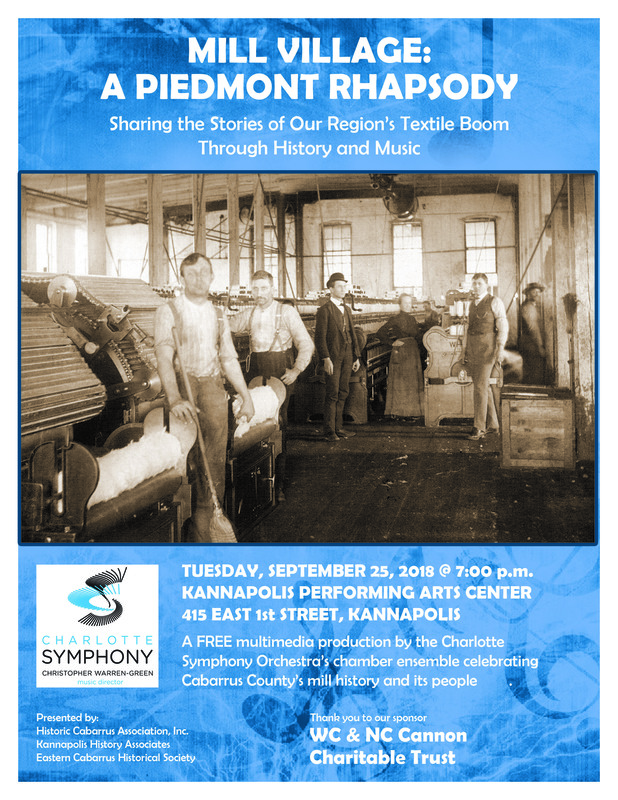 Historic Cabarrus Association, Inc., in partnership with Kannapolis History Associates and Eastern Cabarrus Historical Society, will be hosting the Charlotte Symphony for a night to celebrate the history of North Carolina mill villages and their people, brought to life through music and video. The event is FREE and open to the public. Mill Village: A Piedmont Rhapsody, commissioned by the Charlotte Symphony, debuted in 2005 through the gracious support from the North Carolina Arts Council and the National Endowment for the Arts. The piece sprang from The Mill Community Project, a two-year initiative to create a musical work drawing upon the real experiences of the people of the mill communities. The project focused on the mill villages of the Piedmont region because of the importance that the textile industry played historically in shaping the area both culturally and economically. Cabarrus County has a rich and varied textile history, with mills and mill village houses still standing in Mount Pleasant, Kannapolis, and Concord. For many people in this county the mill lifestyle is very much a part of their recent past. Mill Village: A Piedmont Rhapsody, incorporates film, photos, and voices of textile workers as they experienced daily life in mill villages throughout the North Carolina Piedmont. 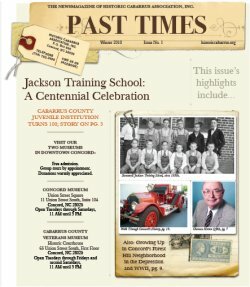 This program speaks directly to the collective history and historical memory of Cabarrus County and its people. 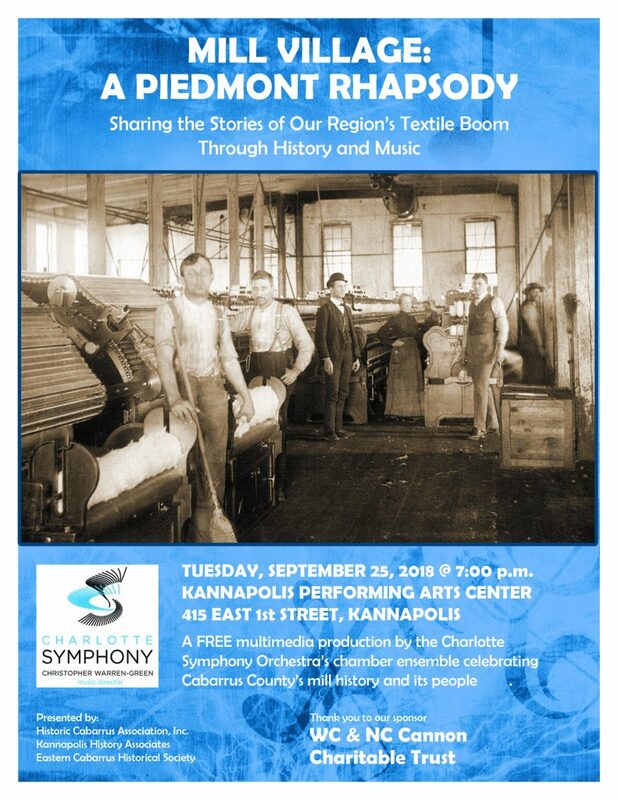 Historic Cabarrus Association, Inc. along with Eastern Cabarrus Historical Society and Kannapolis History Associates will celebrate the histories and memories of Cabarrus County textile mill workers by hosting the Charlotte Symphony for a FREE one-night event on September 25th, 2018 at Kannapolis Performing Arts Center. Board of Directors Member Alex Porter and Board President Reverend Donald Anthony speak to a crowd of over 100 guests at 73 and Main Restaurant, located in the recently restored Mount Pleasant Hosiery Mill in Mount Pleasant, North Carolina. Tuesdays are not typically considered eventful nights. Most people are ready to get off work and spend a relaxing evening at home. 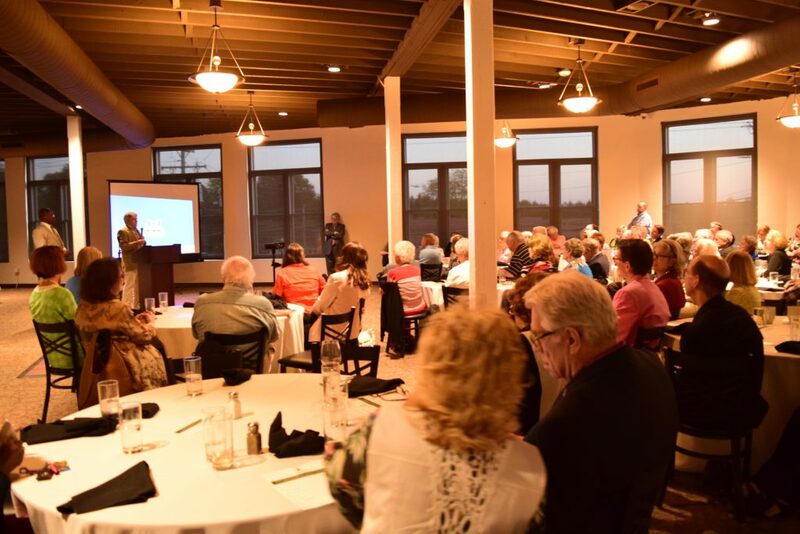 On Tuesday, May 8th, Historic Cabarrus Association, Inc. celebrated our 2018 Annual Meeting at 73 and Main Restaurant in Mount Pleasant, North Carolina. 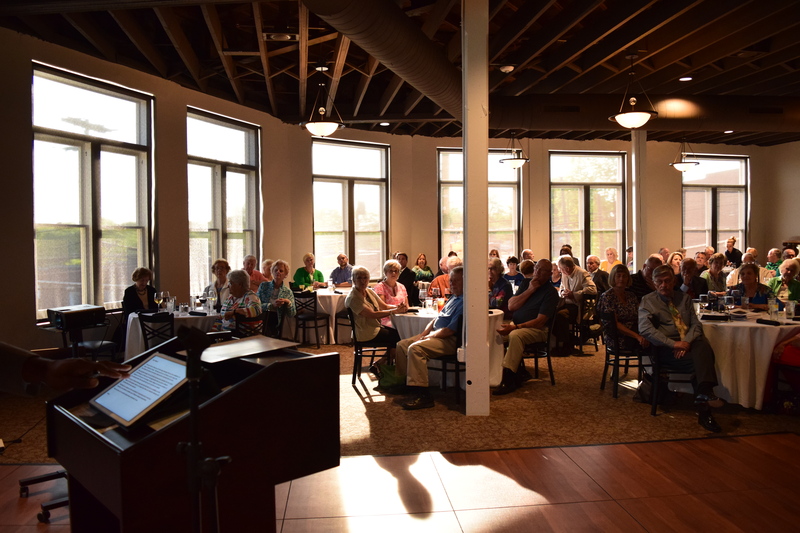 Over 100 guests came and enjoyed a delicious meal and heard about HCA’s past year and our plans for the future, spending an eventful Tuesday evening investing in their community and celebrating history and preservation. 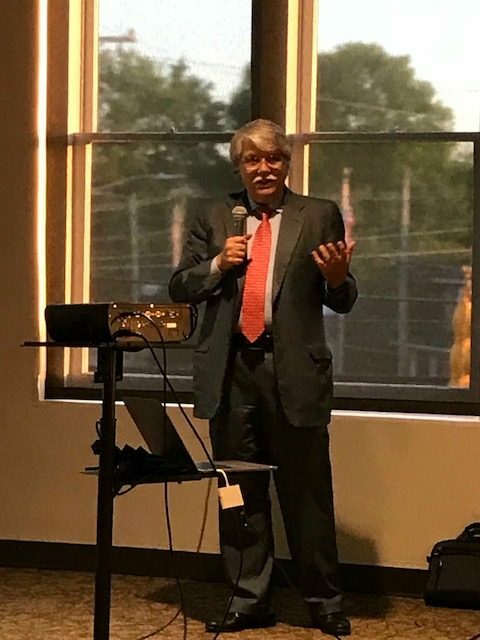 The Keynote speaker, Dr. L. Allen Dobson, is the property manager and the major investor for 73 and Main and part-owner of Mount Pleasant Properties, LLC. He, along with his partners, Dr. Charles Rhodes and Mr. Tom Earnhardt, are responsible for multiple projects in the Mount Pleasant area, including the old Cabarrus County Correctional Center which is now Southern Grace Distilleries, Inc. the only distillery located in a prison in the United States. Dobson, Rhodes, and Earnhardt wanted to invest in the growth of their community. Dr. Dobson envisioned a gathering place that would bring in locals and visitors alike. With his partners, they focused their attention on the historic Mount Pleasant Hosiery Mill, located in the center of downtown. The mill building is steeped in the history and culture of Mount Pleasant. The mill’s story reflects the story of Mount Pleasant. The site began its story as a Mercantile, later becoming a dentist’s office, a Post Office, a furniture store, and in 1932, a hosiery mill. Lee and Paul Foil began the Hosiery Mill which operated in Mount Pleasant under many owners and names and provided jobs for local men and women up until 2008. Dr. Dobson and his partners saw the abandoned mill building as an opportunity for downtown Mount Pleasant to grow. Dr. L. Allen Dobson discusses his inspiration and motivation behind restoring the Historic Mount Pleasant Hosiery Mill during his Keynote address at Historic Cabarrus Association’s 2018 Annual Meeting. At the Annual Meeting, Historic Cabarrus Association presented the first Annual Historic Preservation Award to Dr. Dobson for his work on the Mount Pleasant Hosiery Mill building. The award honors recipients for their dedication to historic preservation within Cabarrus County. 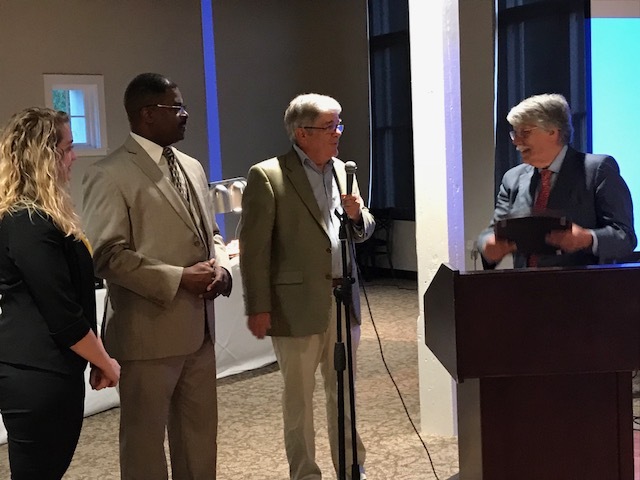 Ashley Sedlak-Propst, Reverend Donald Anthony, and Alex Porter present the first annual Historic Preservation Award to Dr. L. Allen Dobson. Dr. Dobson is known for far more than his work with historic buildings and sites. He is a well-known and well-loved family physician in Cabarrus County. He founded Cabarrus Family Medicine in Mount Pleasant in the late 1980s and went on to help establish the Cabarrus Family Medicine residency program, which has trained family doctors to serve in their communities for 22 years. Dr. Dobson is committed to his patients just as he is to his community. He has served as a champion for Mount Pleasant and the surrounding area through his work as a physician and beyond. The first annual Preservation Award is just a small token of appreciation for all that Dr. Dobson has done for his community through his preservation of the historic Mount Pleasant Hosiery Mill. The evening concluded with tours of the mill building. 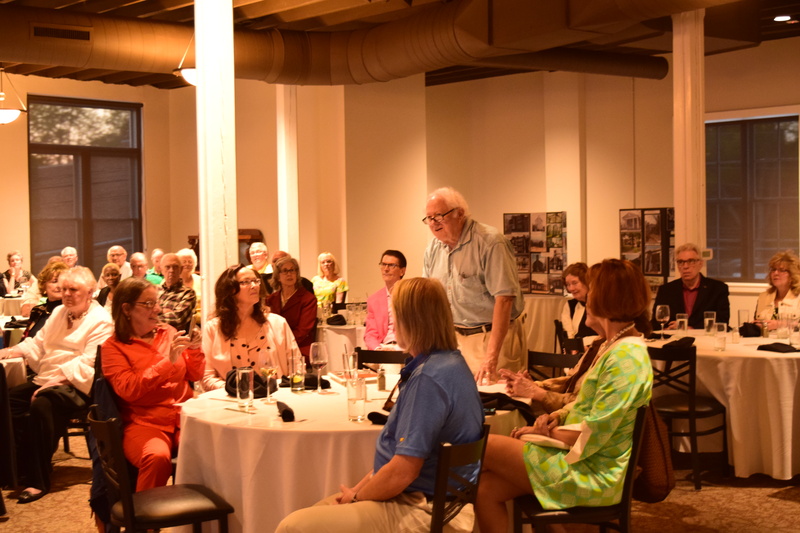 Guests were able to see the beautiful work done to save original pieces of the mill and other businesses that had been housed inside the building. Shelves from the Mercantile have been repurposed as shelving for the rare bourbon bar, the original hardwood on the ground floor has been meticulously cleaned and preserved, and an original well discovered during renovations has been fully restored and is on display on the open patio. Upstairs, where massive hosiery machines used to rumble, there is now an elegant reception hall where the original, tall windows overlook beautiful downtown Mount Pleasant. No detail has been overlooked and diners can feel and touch the history surrounding them during their visit. World War I was known by many names, the First World War, the Great War, and the War to End All Wars. The Great War began in Europe in 1914 and escalated on a global scale, with battles being fought in Europe, Africa, and Asia. An estimated 70 million military personnel were involved in the war and over 9 million soldiers and 7 million civilians lost their lives, making WWI one of the deadliest conflicts in history. The United States, under the leadership of President Woodrow Wilson, maintained neutrality from the escalating war overseas. The U.S. did not enter the war officially until April of 1917. The decision to join the war effort came after Germany declared unrestricted submarine warfare, targeting U.S. merchant ships, and after a particularly alarming telegram was sent to Mexico inviting the nation to join Germany in fighting against the neutral United States. 2.8 million American men were drafted and by the summer of 1918 approximately 10,000 American troops were being shipped to France each day, providing fresh soldiers for the European stage. Cabarrus County provided almost 1,000 men and women to serve in the Great War. 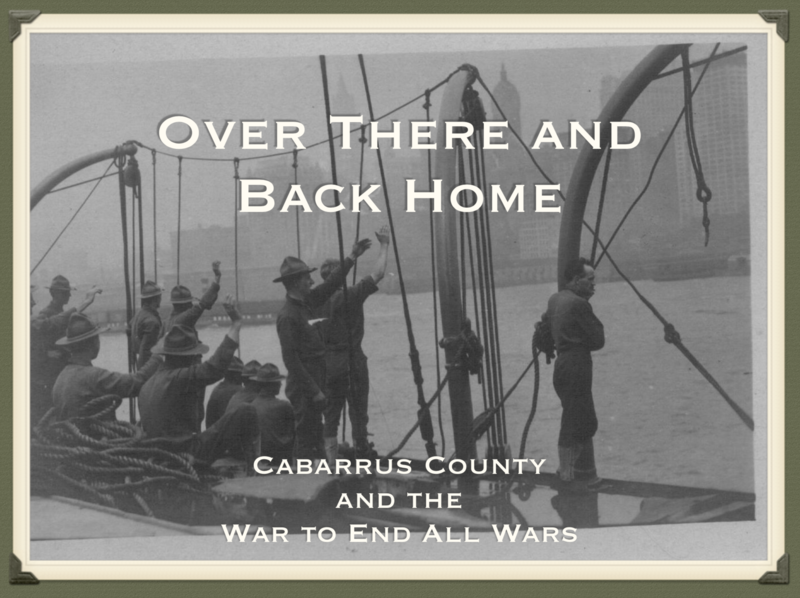 This exhibit will tell their story and the story of the families they left behind in Cabarrus County to protect the Home Front 100 years ago. Photograph of James B. Cannon, son of Charles Cannon of Poplar Tent Road. Cohan, George M. Over There. William Jerome Publishing Corp., New York, NY, 1917. *Composition License: This media file is in the public domain because its copyright has expired. This applies to the United States, where Works published prior to 1978 were copyright protected for a maximum of 75 years. See Circular 1 "COPYRIGHT BASICS" from the U.S. Copyright Office. Works published before 1924 are now in the public domain. Photograph of James B. Cannon, son of Charles Lee Cannon and Minerva Sarah Alexander Cannon of Poplar Tent Road. HCA Collections – WWI Photos. 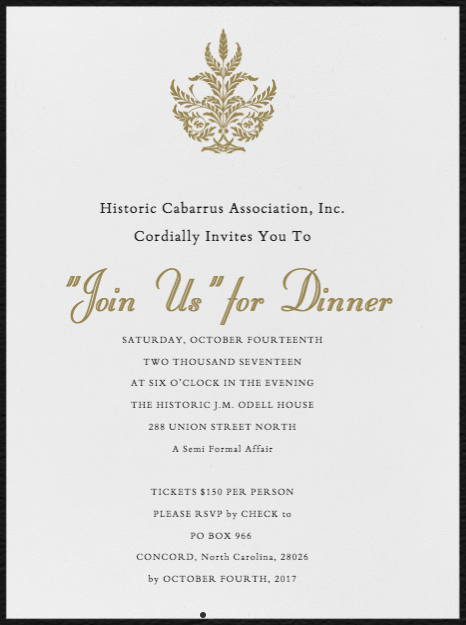 Historic Cabarrus Association, Inc. is looking for a few good volunteers! Summer is coming up faster than you think and The Concord Museum is expecting large numbers of visitors to be coming to downtown Concord. Docents/Volunteers of Historic Cabarrus Association will greet visitors, keep a daily visitor count, and be responsible for handling sales at the Museum Store. The environment at the museum is relaxed and fun! We have rotating exhibits three times a year, which gives volunteers an opportunity to learn about the varied history of Cabarrus County and its many communities. The Concord Museum is located inside the Historic Cabarrus County Courthouse and shares space with the Cabarrus Arts Council, which also has wonderful rotating exhibitions on display. The museum is open 10-4 Tuesday through Friday, and volunteers can sign up for 3 hour blocks one or two days a week depending on their schedule. Weekly volunteer schedules will be flexible and can be changed with advanced notice. If you love history and have a passion for the communities in Cabarrus County this is a wonderful opportunity for you! 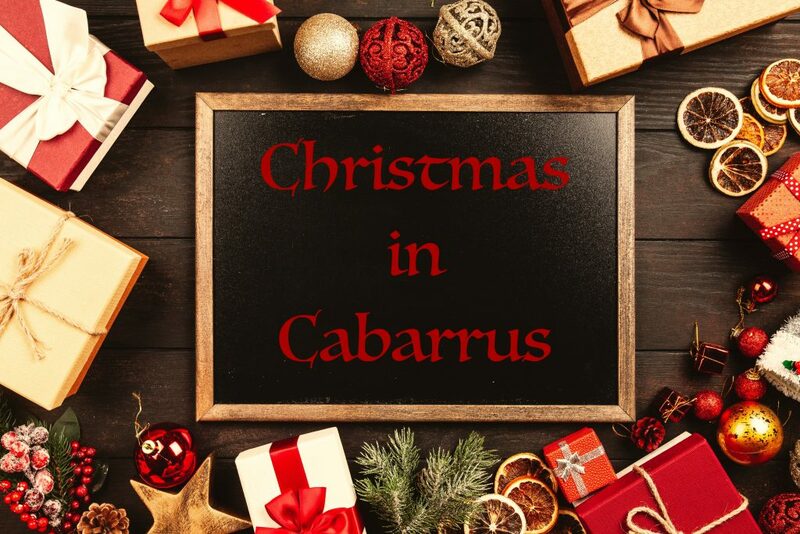 Please contact Ashley Sedlak-Propst for more information: 704-920-2465 or historiccabarrus@gmail.com. Join us on Tuesday, January 9th, 7 p.m. at the Cabarrus County Senior Center, 331 Corban Ave. SE for a fun and informative presentation on the role the Carolinas played in the American Revolution. This event is free and open to the public. When: Tuesday January 9th, 2018 – 7:00 p.m.
A presentation of the events in the Carolina backcountry from early 1780 to the surrender of the British at Yorktown. With more battles occurring within 100 miles of Charlotte, NC, than all the rest of the thirteen colonies combined over the entire eight-year period of the war, much is available to be examined. It begins with the British strategy leading to the campaign in the South and the events that took place over the next eighteen months. A detailed description of the Battle of Charlotte is presented. Places such as Ramsour’s Mill, Buford, SC, Kings Mountain, Cowpens, Guilford Courthouse, Waxhall and others, all of which are just a short drive away are also explored. When a battle is fought, what is the significance of the outcome and how did it affect those involved and the strategy employed in the future? Such a discussion enlightens the overall appreciation of the events as they occurred. More important, is the examination of the people and personalities involved on both sides. Not just the military commanders, but literally the civil war that existed among neighbors and even among immediate families. Included in the presentation are pictures of the areas discussed and how they look today. What is passed by, sometimes on a daily basis, often is the location of a very significant occurrence. The overall purpose of this presentation is to give the person attending a deeper appreciation of this area’s part in the struggle for our nation’s independence and the many sacrifices made by our forefathers so that we, as ordinary citizens, may enjoy the liberties we have today. 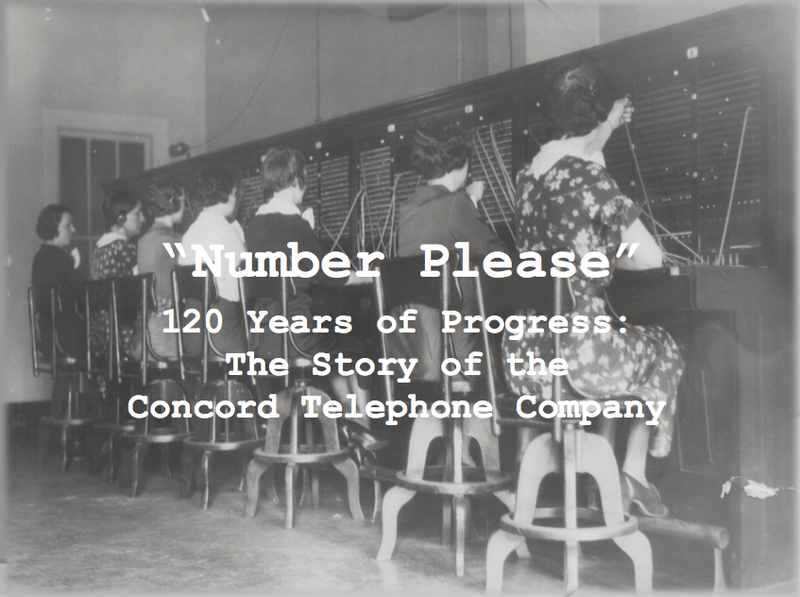 The Concord Museum will be opening on August 15th with their newest exhibit, “Hold the Phone” 120 Years of Progress: The Story of the Concord Telephone Company. 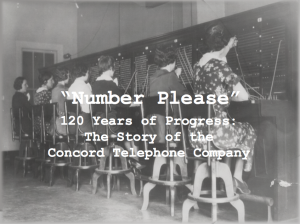 The exhibit features artifacts, documents, and photographs from Historic Cabarrus Association’s Concord Telephone Company collection. Visitors will have the opportunity to view and interact with a visual timeline of the evolution of the telephone, from the early 20th century to today. “Hold the Phone” will be on display at the Concord Museum through January 26th, 2018. Boasting a blend of Italianate and Second Empire architectural styles, the John Milton Odell house stands as a shining example of downtown Concord’s architectural legacy. The house has been lovingly restored by current resident Richard Milan, who has generously opened his home to Historic Cabarrus Association. We look forward to having you join us for a Haunting, Historical Event with dinner, drinks, and tours of Mr. Milan’s beautiful home. $100 of your $150 is a tax-deductible donation that will go towards funding restoration and preservation projects within Cabarrus County. Your donation will also make you a member of Historic Cabarrus Association for one year. Please RSVP by calling 704-920-2465 or reserve your seat by mailing a check to P.O. Box 966, Concord, NC 28026. Did you know Historic Cabarrus Association awards Outstanding Young Historians? Each May we honor a Middle or High School student attending a Cabarrus County school for their dedication to the study of the history of Cabarrus County, the State of North Carolina, and/or the United States. Our inaugural recipient, Miss Dorothy McGee put together a pamphlet and program on the historic portraits on display in the 1876 Historic Cabarrus County Courthouse, partnering with The Honorable Judge Clarence Horton for her project. Miss Maizie Croom worked in the HCA Archives as part of her 8th grade IB project, helping sort and preserve letters written and received by a Concord native in 1904. One of your students could be next! Please check out the link below to see our Nomination Form and to learn more about nominating your outstanding young historian. Students are honored and presented with a Certificate of their achievement at our Annual Meeting each May. They are also honored with their name on our Award Plaque, displayed at the Concord Museum.